This great lens was standard on Praktica body. Nowadays the latest MC version is getting more and more popular, because it is pretty sharp at one f/stop down and it has nice "bokeh" and very good color rendering. While relatively common in Exakta mount, this lens in M42 mount is quite scarce, and so far found only in the earlier-type black barrel with bright aperture ring finish, equipped with opposite-moving prongs for indicating depth of field. 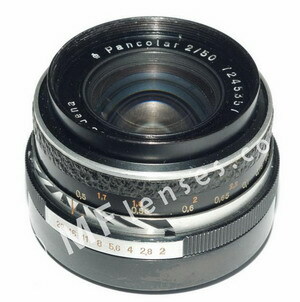 When the cosmetics was changed to bright fluting on black the Pancolar 1.8/50 took its place. Personally I like this lens more than other 50mm focal length lenses, like Carl Zeiss Jena Tessar or Pentacon 50mm and others. Industar-50 "pancake" lens is really alike of this lens. Sharpness is better than the Pancolar's, but in all features -I suppose- Pancolar is the best. With reverse macro adapter it works fine as macro lens. I suppose MC version is slightly better, but I am not sure at all, perhaps I just shoot in different season, and this makes the difference. Anyway this lens is highly recommended too, in M42 mount it is much more rare than MC version. Was this lens that got me into photography, on my late father's Exakta. Oh, it was superb on every quality. By the time the Exakta was completely worn out, I had it replaced with a Nikkor f1.8/50, which to put it simply paled by comparison.